One of the winners of the 2015 User Conference poster session presented on a GoldSim application for a phosphate mine in central Florida. After reading more about this application, I began to better appreciate the great work that Cardno has been involved in. 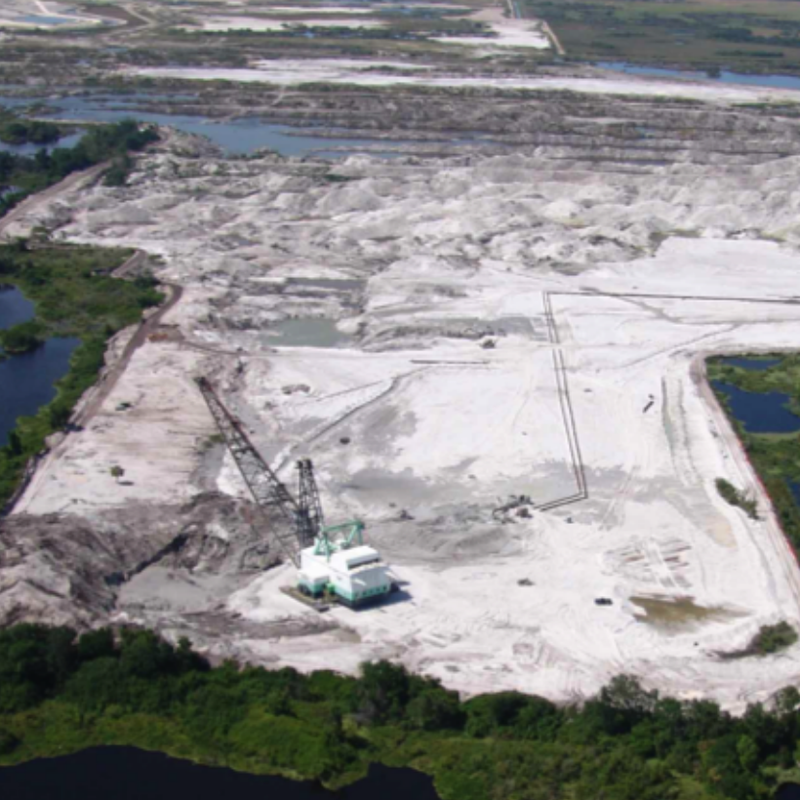 The phosphate mining industry faces very strict effluent limitations while having to manage several hundred gallons of water around the site every day. The model must account for a continuously changing landscape of flow paths and operating schemes under varying hydrologic conditions. Read about how GoldSim is being used to help the mining company make better decisions as they comply with these changing regulations. Every 130 tons of grain produced requires about a ton of phosphate for fertilization. The world mines about 170 million tons of phosphate rock every year to support food production, which is continually on the rise. Phosphate rock is usually mined from just below the ground surface from a matrix of pebbles, sand, and clay, which is referred to as a "phosphate matrix". Draglines are used to strip off the top layers of soil above the matrix, called overburden. 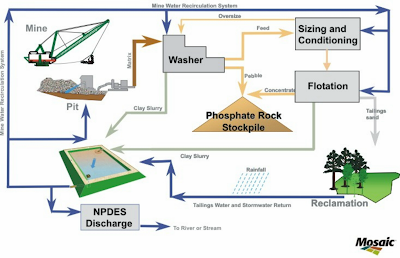 Water is used during the process of stripping, mining, and processing the phosphate matrix and stockpile it before further processing it. Prudent management of the water volume and its chemical composition is critical to the sustainability of this business; any failure to do so has the potential for consequences well beyond the property line of just that mine. Mosaic Company is one of the largest producers of phosphate for fertilizer in the U.S. and they are relying on GoldSim to help with key decisions made for their phosphate production process. A pilot model was created to determine if the complexities of a typical phosphate mine can be successfully reduced to a mathematical simulation. Cardno is continuing to expand on the pilot model as the project progresses. Simulation is a decision analysis and support tool. GoldSim is a simulation platform that allows you to evaluate, compare and optimize alternative designs, plans and policies. As such, it provides a tool for explaining and defending decisions to various stakeholders. 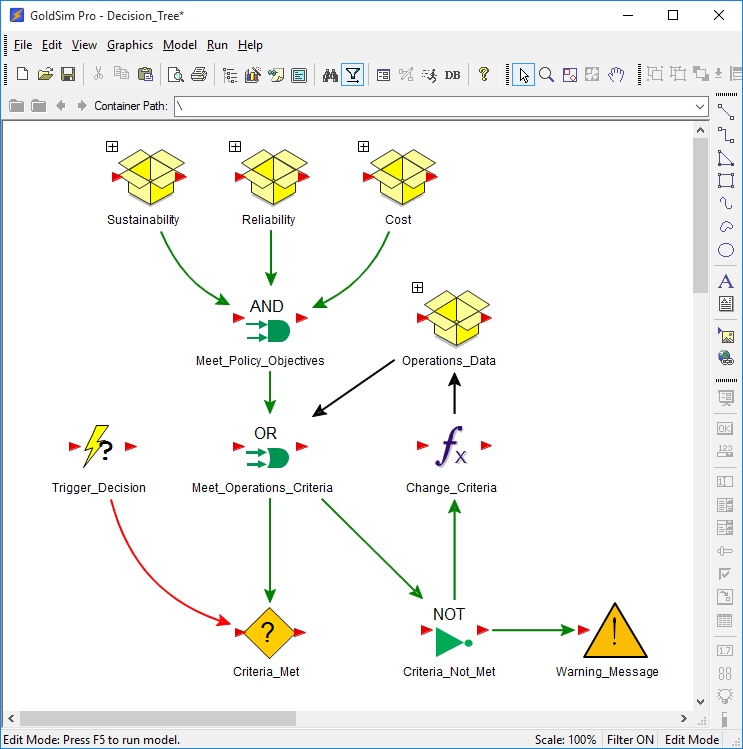 Not only can you build a schematic flow diagram with logic to define the flow paths of materials and water in the model, you can also build the actual decision-making process that the people use to operate the system. 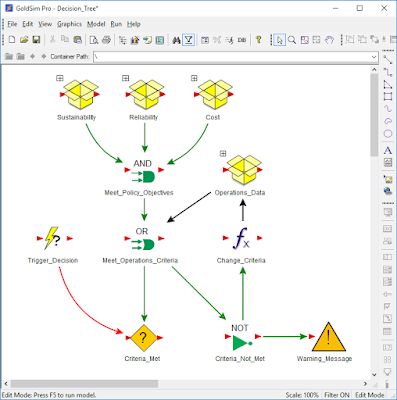 Decision diagrams built within the model can be encapsulated into various parts of the model to control flows and key changes to material handling as the system changes over time. 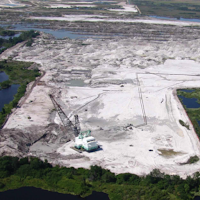 Phosphate mining requires careful management of water and materials as the phosphate is mined, washed, processed, and stockpiled. Water must also be treated and recycled in order to protect the environment. A mine water flow sheet (Figure 3) illustrates the basic flow paths of the process water. discharge water from the mine and/or the nutrient levels would exceed regulation limits. The model takes into account the operations decision making at the various facilities and handling of materials and water. Initial results show the model accurately predicts discharge probabilities and levels by simulating the water management decisions throughout the mine. Secondary objectives are to predict pond water levels during varying hydrologic scenarios. These predictions could be valuable information to improve management decisions (what level to hold ponds at in preparation for rainy season and major storms). Past observations indicated an unknown process was removing phosphorous from the water system. 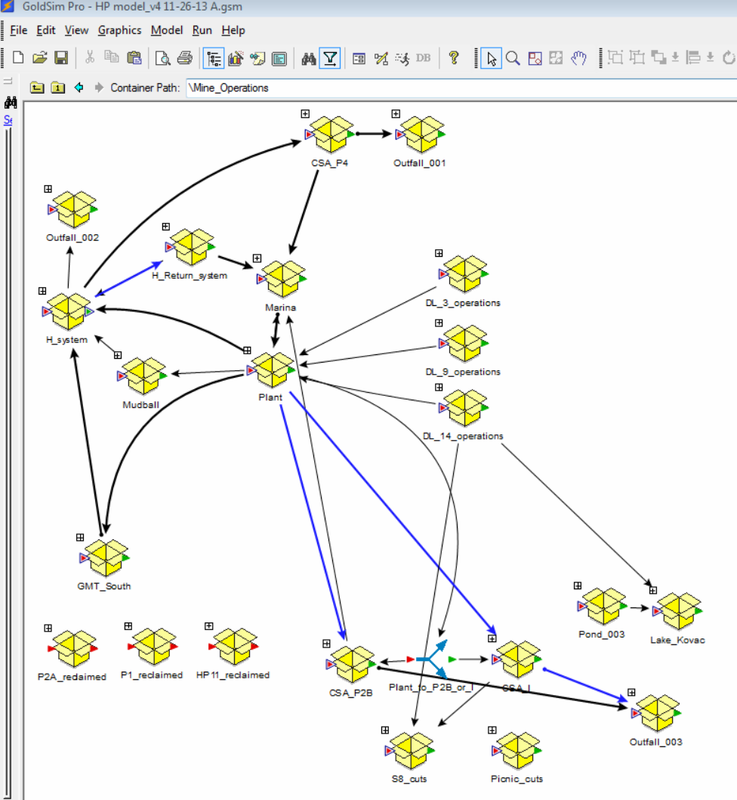 GoldSim has provided a robust framework to simulate this complex flow network, along with all the decision logic and dynamic changes that occur in an efficient manner. Cardno was able to better use their ranges of expertise to solve the problems of the application while GoldSim took care of the details needed to handle complex data, organize concepts into model logic, and develop coherent results that can be used by all the various stakeholders involved. For more information about this project, please see the Transcript of Mine Water Solutions in Extreme Environments, 2015. Remaining work to be done on this project includes further development of the nutrient consumption model, which is used to predict future concentrations. This is another great application of GoldSim. Decision frameworks allow added transparency and increase stakeholder buy-in. It's great to see a producer like Mosaic attempt to tackle environmental management problems using the robust framework that can be developed in GoldSim.